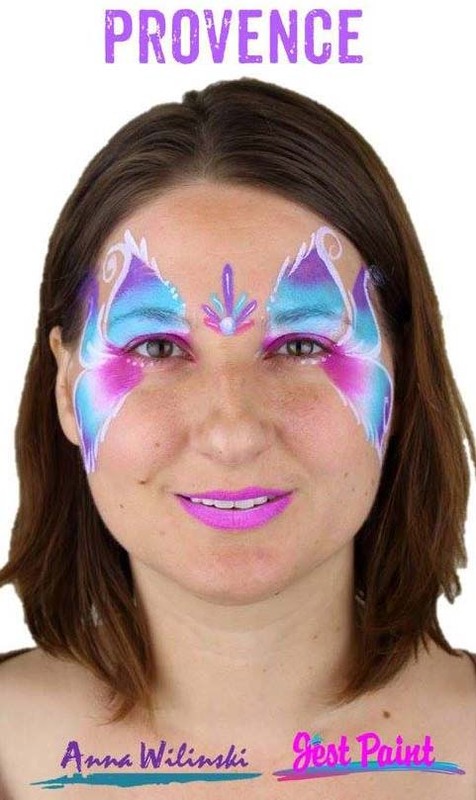 Tips for working with Face Paint Rainbow Cakes! This is Anna Wilinski reporting in with a ton of pictures of my face painted! This post will hopefully be a good one for those that are new to using rainbow cakes, and for those of you with some experience using them. All of the designs were done with Global Rainbow Cakes and used a slightly different technique for each so that you can create a variety of eye masks and full face designs with your rainbow cakes. Starting with the green Everglades Monster, I kept the dark colors on the outside and the yellow in towards the center. I added a little yellow to help create the eyebrow arch and the eyelid highlights. I did the same thing for the Kenya Fox’s cheeks, but I flipped the sponge to make the ears. I also did a dark to light gradient down the nose. For the Caribbean Mask I flipped the sponge for the forehead area, and I pinched the sponge to make smaller bottom wings, and fanned it out a little for the upper wings. To create the Maui Mask, I held the sponge so that the gradient over the wings shot out towards the temples. This showcases more of a rainbow effect diagonally coming from eyes. For the New Delhi Butterfly I held the sponge and fanned it across the top and bottom eye lid, with the wings meeting at the inner corners and outer corners of the eye. The French Quarter Mardi Gras Mask uses the same fanning technique, but includes a little sponge press in the middle of the forehead, and the wings connect up at the top of the bridge of the nose, making a full mask. The Spain Cat was really easy, after sponging in a light yellow base in the middle, I just went around the edges keeping the darker colors on the outside of the face. The Mojave is like the Spain Cat in reverse, with the darker edges around the bottom half of the face. The Tibet Star Mask has three fans, without any flips of the sponge. For Provence, I used the Splash Pointed Petal Sponge to make these skinny wing sections with pointy tips. I squeezed the sides of the sponge to do the really skinny wings coming up and out from the sides of my eyes. 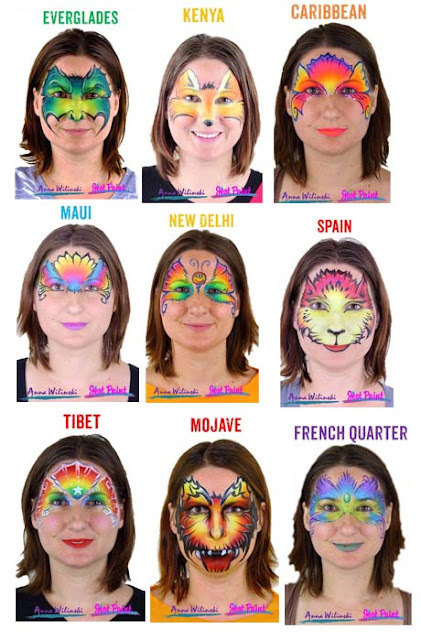 If you love face paint, check out all of these awesome face painting supplies at www.jestpaint.com! Awesome. I have recently went from TAG to global, both are very good paints and pigmented. I’ve been thinking of doing tutorials too.